The CSS margin properties control the space outside of HTML elements. 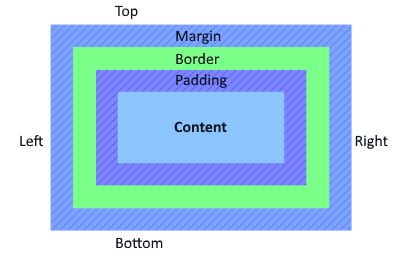 The margin refers to the space outside the edge or borders of elements, and it can be controlled with the CSS margin properties. Note. If you want to control the padding (space) inside an element, use the padding properties instead. When the margin properties are used, it is usually to create distance to neighboring elements, but they can also be used to move elements closer to each other, usually done by applying a negative margin on an element. Vertical margins on elements can collapse when they collide. For example, when paragraph elements both have a top and bottom margin, the margin will collapse into the greatest of the two, so a margin of 1em and 2em becomes 2em – not 3em. Horizontal margins never collapses. margin The shorthand way to apply margin. margin-top Space on the top-edge of an element. margin-right Space on the right-edge of an element. margin-bottom Space on the bottom-edge of an element. margin-left Space on the left-edge of an element. The shorthand way of applying margins is usually the better choice, and will work in the following order: top, right, bottom, left. I.e. The above is possible because undefined values in the margin property automatically get copied their opposites. Because we did not define the left value, the right value of auto is being copied to the left value. It is the same for the top and bottom values. The equivalent is to set the margin-left and margin-right properties to auto. A common way to center a website is to use a div wrapper around the page, and set the margin needed.